It was a thriller of a race at Phillip Island. 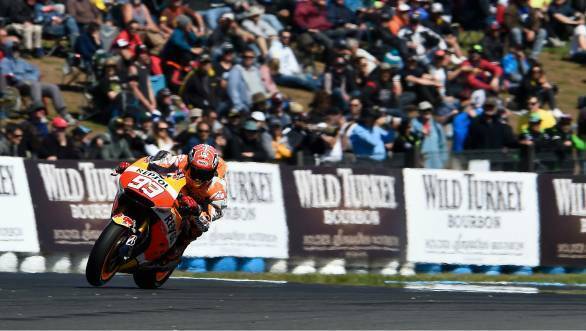 And when the chequered flag fell, it was Marc Marquez who had crossed the finish line first astride his Repsol Honda in what was to be his first ever win in the premier class at the track. It was also his fifth win of the 2015 season, a season that has not been without challenges for the twice premier class champion. Even though it was Marquez on pole at Phillip Island, it was Jorge Lorenzo who took the lead early on and looked as though he was set to win the race. He opened up the gap to the riders behind him - a pack that included Marquez, Valentino Rossi and Andrea Iannone - who were all swapping position with every passing corner. Ultimately though, during the closing stages of the race Marquez caught up to the Yamaha rider. And then, on the very last lap, he was in the lead once again. The win, for Marquez, was very sweet indeed. Lorenzo, who'd finished the race second was happy for the fact that he had managed to finish ahead of his Yamaha team-mate and championship leader, Rossi. Going into the race, Rossi had led the standings by 18 points. But given that Rossi finished fourth, with Ducati rider Andrea Iannone putting in a stellar ride to take the last spot on the podium, the gap between the sparring Yamaha team-mates has reduced to 11 points. With just two race - Malaysia and Valencia - to go. Fifth place went to Marquez's Repsol Honda team-mate Dani Pedrosa, who won at Motegi a week ago. Maverick Vinales took sixth place for Team Suzuki Ecstar, with Cal Crutchlow finishing seventh, brothers Pol and Aleix Espargaro eighth and ninth and Bradley Smith tenth.